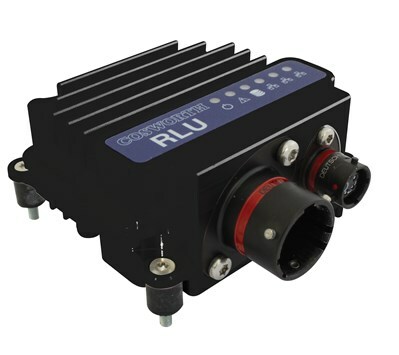 The Cosworth RLU is a high bandwidth Ethernet data hub which enables multiple streams of Ethernet data to be logged directly to a standard USB memory stick for instant data offload. Compatible with a range of Cosworth data loggers, ECUs and power controllers. The RLU contains an integrated 100Mb/s Ethernet switch enabling connectivity for up to two Ethernet devices, plus a single PC connection for system configuration. This combination allows the RLU to act as a central Ethernet Hub. Measuring just 32x70x80mm and weighing only 160g the rugged anodized aluminium finish is specifically designed for use in harsh environments where space and weight are important factors. The USB port has been designed to be extended via a USB extension cable to enable easy access to remove the USB stick. Lengths of up to 3m between the RLU box and the USB plug-in point are supported.